« We’ve Got Things Going On Here! 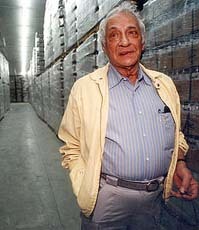 Mr. Schafer, a resident of Little Rock outside of Dillon, gained wealth and clout as the attraction grew. Eventually, he began to exercise his political muscle. When it came time to build the interstate, Mr. Schafer “had the political influence to get I-95,” said University of South Carolina historian Walter Edgar. “It makes a little jag there to go through South of the Border.” Mr. Schafer’s political imprint is clearest in the Democratic Party. He gave freely to candidates and the party. He also was one of the biggest spenders in campaigns to protect video gambling, pumping tens of thousands of dollars into advertisements. South of the Border held the state’s largest video gambling operation until the state outlawed the games. Former Gov. David Beasley’s campaign sued Mr. Schafer and fellow video gambling operator Fred Collins to try to stop the ads, claiming gambling interests illegally coordinated their efforts. Circuit Judge Tom Ervin ruled in favor of the businessmen. In the waning days of segregation, South of the Border was one of the first rest stops between Washington, D.C., and Miami to welcome African-Americans. Alan Schafer died on July 19 from leukemia at age 87. This entry was posted on Wednesday, October 7th, 2009 at 3:43 am	and is filed under History, Press, Schafer Family. You can follow any responses to this entry through the RSS 2.0 feed. You can leave a response, or trackback from your own site. I first saw “The Border” in the mid 1960s. Interstate 95 was just a dirt road bed at the time. I’d never been out of Fairfield, Westchester and Passaic counties my entire life till then. I have pictures from that visit. I never tire of looking at them. Then in the early 90s, my husband and I drove the family to Florida a few times and he said when I saw the tower my face lit up like a beacon. We made it our halfway destination stop. Comparing the pictures to the more recent visits takes some imagination. The zoo became mini golf. Thank you for putting the kid back in me. Ms. MacPhedran-Podwall, thanks for your posting! It’s great to hear from folks who have been our guests at pedro’s South of the Border. We love having you tell us of your fond memories! We hope that you’ll get an opportunity to visit soon to see the new changes that have been (and continue to be) made! I remember stopping at SOTB when I was young and still to this day I stop in when I go to Pa. to visit, It brings back lots of memories when I was young to me SOTB is like Disneyland to some it was like the highlight of our trip.Now I’m in my late 40’s (49) I’m glad it’s still around to bring my girl, we are planning a trip up home next year and we will stop in, like I said when I travel up 95 and I see SOTB it brings back lots of memories. Thank You for a real fun time when we stopped in all the time everyone I met there was so nice. My family and I stop by South Of The Border each time we visit Myrtle Beach. 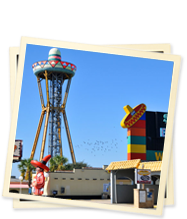 My kids love going to the top of the “Sombrero.” As a teenager, I used to love stopping to eat tamales, to meet new people, to play at the arcades, or just to buy a couple of fun souvenirs. We used to buy our fireworks here. It was very different than it is now, but I love going back every time. It brings back a lot of memories. The comfort of being around a lot of people who enjoyed a sense of our culture, was terrific. Thank you for the amazing memories.